This treasury of anniversaries and milestones marks the significant events in Unitarian and Universalist faith heritage for every day of the year. This Day in Unitarian Universalist History spans six centuries of liberal religious tradition—from Transylvania, where Prince John Sigismund proclaimed himself a Unitarian in 1568 and published the Edict of Torda, to the consolidation of Unitarians and Universalists in 1961, to the UUA’s modern movement of welcoming all people regardless of race, gender, sexual/affectional orientation or ability. 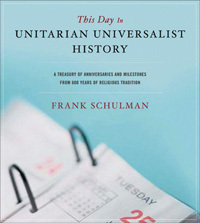 Well organized and easy to use, this book’s unique day-by-day format is ideal for ministers, lay leaders, religious educators and anyone who wishes to make UU religious history a part of his or her daily life. The extensive index includes major themes in Unitarian and Universalist history and information about congregations. If we steadily apply ourselves to even a portion of the events, personalities and ideas presented in these pages, we will inevitably begin to feel our ordinary course of living enriched, to feel that some new dimension, some new gravity, has been added to our experience.